I want to make this post brief. So here I go. "But the Spirit explicitly says that in the later times some will fall away from the faith, paying attention to deceitful spirits and doctrines of demons, by means of the hypocrisy of liars seared in their own conscience as with a branding iron"—Paul to Timothy in 1 Timothy 4:1-2. I just finished reading the book New Evangelicalism: The New World Order by Paul Smith, brother of Calvary Chapel founder Chuck Smith. I highly recommend it. In the book Smith meticulously traces the history of the founding and fall of Fuller Theological Seminary, which allowed an admitted non-Christian Peter Drucker to teach and went on to mentor a young Rick Warren. Warren learned Drucker’s lessons well and effectively applied those lessons in his Purpose-Driven Church paradigm, which the Southern Baptist Convention, right along with most other denominations, sucked up and promoted without exercising even the slightest degree of discernment. This was the logical step following Fuller Seminary’s rejection of the inerrancy of Scripture that began in the early sixties. Following the turn from Biblical Ecclesiology (what the Bible teaches about the Church, it’s function and purpose) and Biblical sufficiency, the logical conclusion to the rejection of Biblical inerrancy, churches were left adrift, and the constant need to reinvent themselves in order to keep the masses interested left church leaders and the masses sensing that something was missing. Indeed there was. However, the void left by the removal of healthy biblical teaching offered the perfect opportunity for the next phase of Satan’s plan to destroy or at least weaken the Lord’s Church. 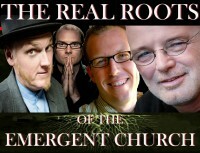 Enter the Emerging/Emergent church "conversation". The Emergent Church leaders have successfully lead many even further away from the truth that can only be found in God’s written, inerrant word with the sparkly, shiny trinkets of Satan’s lies. Instead of healthy, biblical teaching (doctrine, there, I said it) the Emergent leaders have offered a return to Catholic mystics, Eastern religions such as Yoga and yogic meditation, Zen Buddhist philosophy, gnostic inspired Christologies, and the gospel of psychological therapies; I’m okay, your okay. Now light the incense, breathe and recite your mantra. The quote from Paul’s message applies to these teachers. They have had their conscience seared as with a branding iron having fallen head first for the doctrine of demons. They have been "take(n) captive through philosophy and empty deception" (Col. 2:8) and in turn have willfully led others into the same black hole of deceit. Here is my main objective. I want to provide some names for you to watch for and from whose teaching and writings we need to flee. Please don’t write me nasty letters (like that’s not gonna happen) if a name of someone you like appears on the list. I also won’t accept names of those I’ve missed, but thanks in advance for for the heads up. I know there are more. Guys like Mark Driscoll are very, very iffy. But I can’t put everybody on here. I am a simple pastor attempting to correctly handle God’s word (2 Tim. 2:15). I believe I have a responsibility to try and warn as many sheep concerning the most popular wolves occupying positions of authority in the Church. Consider this as my attempt to fulfill my duty for the love of the Bride of Christ.